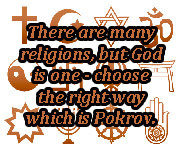 Pokrov - spiritually religious movement. Those who believe in God from all of the religions and spiritual practices unite! Knowledge and comparisons of religions, and finding the true faith in God. Working on karma, changing it in the better way, exiting from any of the most difficult life situation.